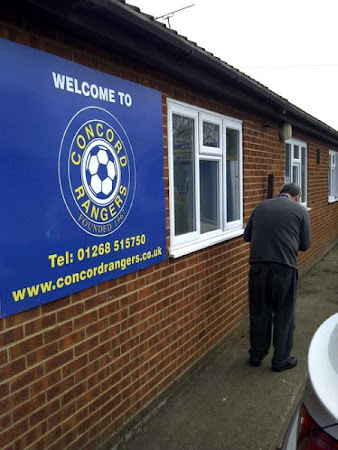 If I’m honest (and I am) there is no real connection between the work of Pulp and Concord Rangers, but they were on *insert name of branded MP3 player here* on the train over the Canvey Island and so they will now define mine and your view of them. Don’t judge me internet, don’t judge me. Canvey Island sounds a much nicer place than it actually is. Rather than some glamorous island paradise, it is fairly identical to the area around it, i.e. Essex. 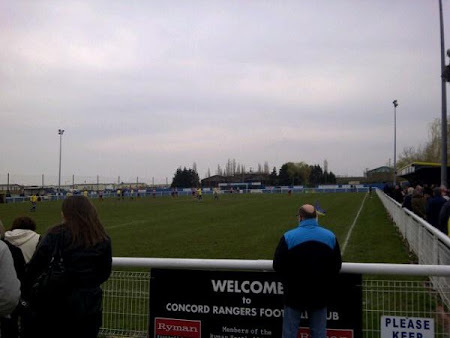 To be frank I bought into the myth and hence despite other games on offer Saturday saw me ready to trek to the island to watch Kingstonian’s continue promotion push against the islanders Concord Rangers complete with shorts, suncream and bucket and spade (N.B. not strictly true). Yes that is right, the allure of the game being played on the island (and it being my first visit there only added to the excitement), any island would do as long as we were off the mainland! I presume this counts as a ‘European football’ trip rather than your average non-league day? What better way to take a trip to the island than drinking for a few hours before in central London, so accompanied by seasoned ground hoppers and Ks fans Simon, Ali and Ollie we headed to London Bridge to find a wonderful assortment of pubs serving an accompanying assortment of ales. Some say 11 o’clock is too early to start, however due to the island nature of the trip it was safe to agree that we were operating on a European clock, and noon is a more than acceptable starting time for such frivolity. At this juncture a guide to the pubs and beers of the area surrounding Borough market would be wonderful however names escape my now sober mind. If I could offer one piece of advice it would be to search for the pub on a corner that bans football shirts but sells the most gingery ginger beer (alcoholic naturally) on tap in proper glass tankards that I have ever tasted. Glorious. 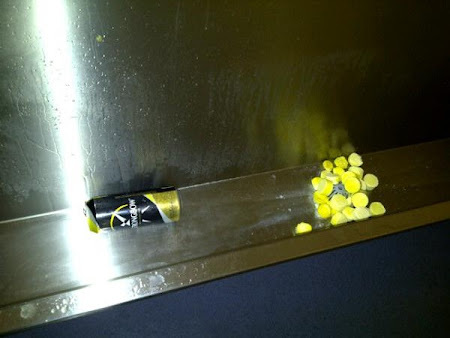 And so cans in pocket we left London behind us, embarking on a train to Essex, past the Olympic Stadium on a carriage where the toilet was operated by brute force rather than National Rail’s normal assortment of buttons. Off the train, into a cab and on to a ground with seemingly no name other than its home on Thames Road. Perhaps my favourite aspect of accidentally turning into a Kingstonian fan has been at the atmosphere amongst supporters. Their reputation amongst the league is one of loud support and perhaps it is this sort of pre-match preparation that results in such support. Arriving in the club house (stocked with a disappointingly predictable set of beverages that resulted in a pint of generic cider) we found it full of away fans clearly enjoying what wasn’t their first drink of the day. Spotting two pool tables in one end of the room we found the kind of quirk that you only find at this level: two identical pool tables, one charging 50p, the other a pound. Suspiciously checking for a con we found none and our pre-match entertainment was settled. Well, settled alongside the fun game of convincing a fellow Ks fan that there was a woman selling doughnuts in the bar that had him asking everyone in the clubhouse who he didn’t recognise if they were selling doughnuts. Ah simple pleasures...... The other quirk of the clubhouse was a male toilet separated by only a thin wall to the home changing room which meant one’s urinatory procedure resulted in an ear to opposing tactics. As joyous as the Ks support is, when faced with a ground surrounded by mobile homes on a place like Canvey the songs and support are, whilst naturally hilarious, depressingly predictable. And so whilst the wheels on their house may go round and round (most of them are actually on bricks) an afternoon of the football-supporters habit of tarring folks with the same brush was in store, especially when the fans are from the suburbs of Kingston. In fact recent statistics show that 38% of games at this (and any) level are watched down ones nose. 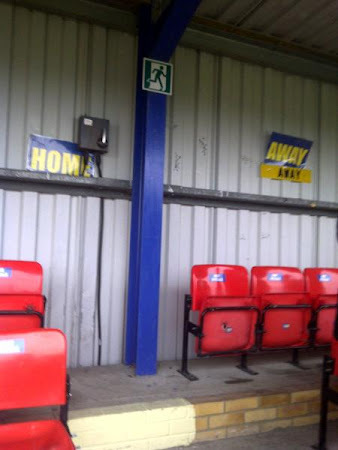 Unfortunately, as friendly as the hosts were, the caravans and the nearby sewage works are the most notable aspects of the ground, one small seated area on one side and matched by two even smaller ones on the other side, I’d even forgotten an EFW logo to bring some glamour. Unfortunately in the second half something did indeed change, Concord decided to play football and Ks defense decided to tour the rest of the island. Within 15 minutes Concord ran into a two goal lead courtesy of a missing right back followed by a glorious through ball by Ks own midfielder to set through Ashley Miller to seal the game up. Train back to central London, out to Surrey, a can of Strongbow (oops), The Blizzard on my phone and a shedload of chicken nuggets saw us get home happy before collapsing into bed at a strangely early hours of 10PM. That is what starting drinking at European time after a trip off the mainland will do to you. There couldn’t have been less of a ‘Live Bed Show’ as many hours sleep was broken only by daylight ah non-league football you strange and beautiful mistress. Like this? You might like another Kingstonian match report from the same author.